This picture, taken by Hubble’s Wide Field Camera 3 (WFC3), shows NGC 4696, the largest galaxy in the Centaurus Cluster. The new images taken with Hubble show the dusty filaments surrounding the centre of this huge galaxy in greater detail than ever before. These filaments loop and curl inwards in an intriguing spiral shape, swirling around the supermassive black hole at such a distance that they are dragged into and eventually consumed by the black hole itself. New images from Hubble reveal the intricate structure of the galaxy NGC 4696 in greater detail than ever before. The elliptical galaxy is a beautiful cosmic oddity with a bright core wrapped in system of dark, swirling, thread-like filaments. NGC 4696 is a member of the Centaurus galaxy cluster, a swarm of hundreds of galaxies all sitting together, bound together by gravity, about 150 million light-years from Earth and located in the constellation of Centaurus. Despite the cluster’s size, NGC 4696 still manages to stand out from its companions — it is the cluster’s brightest member, known for obvious reasons as the Brightest Cluster Galaxy . This puts it in the same category as some of the biggest and brightest galaxies known in the Universe. Even if NGC 4696 keeps impressive company, it has a further distinction: the galaxy’s unique structure. Previous observations have revealed curling filaments that stretch out from its main body and carve out a cosmic question mark in the sky, the dark tendrils encircling a brightly glowing center. An international team of scientists, led by astronomers from the University of Cambridge, UK, have now used new observations from the NASA/ESA Hubble Space Telescope to explore this thread-like structure in more detail. They found that each of the dusty filaments has a width of about 200 light-years, and a density some 10 times greater than the surrounding gas. These filaments knit together and spiral inwards towards the center of NGC 4696, connecting the galaxy’s constituent gas to its core. This video pans over NASA/ESA Hubble Space Telescope observations of the massive galaxy NGC 4696, which lies about 150 million light-years from Earth. In fact, it seems that the galaxy’s core is actually responsible for the shape and positioning of the filaments themselves. At the centre of NGC 4696 lurks an active supermassive black hole. This floods the galaxy’s inner regions with energy, heating the gas there and sending streams of heated material outwards. It appears that these hot streams of gas bubble outwards, dragging the filamentary material with them as they go. The galaxy’s magnetic field is also swept out with this bubbling motion, constraining and sculpting the material within the filaments. At the very center of the galaxy, the filaments loop and curl inwards in an intriguing spiral shape, swirling around the supermassive black hole at such a distance that they are dragged into and eventually consumed by the black hole itself. Understanding more about filamentary galaxies such as NGC 4696 may help us to better understand why so many massive galaxies near to us in the Universe appear to be dead; rather than forming newborn stars from their vast reserves of gas and dust, they instead sit quietly, and are mostly populated with old and aging stars. This is the case with NGC 4696. It may be that the magnetic structure flowing throughout the galaxy stops the gas from creating new stars. 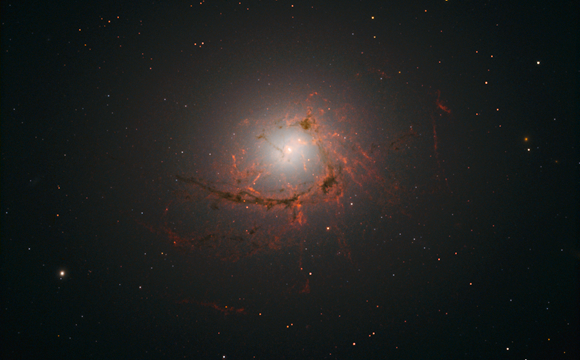 Be the first to comment on "Hubble Reveals Dusty Filaments in NGC 4696"